Costs – Have you prepared your Miami, Florida trees for hurricane season yet? Don’t wait, get them taken care of now. We have all the information you need on costs when it comes to tree trimming, removal or stump grinding and removal so you can get a price in your mind to compare to the professional’s quote. FAQs – Miami might be near the ocean, but there are more than just palms available that thrive in its environment. See types of trees you can plant, what not to plant, diseases and pests to keep an eye out for, more about Florida’s state tree, city regulations when it comes to resident tree care, where you’ll find the tallest tree in Miami, and plant hardiness by zone in Florida. Services – Hurry before June 1st and get those trees taken care of. We have the list of professionals in your area. You just need to pick one and call. How Much Do Tree Services Cost in Miami? Miami, Florida hugs the Atlantic Ocean and enjoys hot summers for all of its residents. That heat means a lot of sunshine though, which also means the need for trees (not just palms, either). A wide variety of trees survive the Miami geography and mineral makeup, as long as they’re cared for by their owners. Enjoy the summer with shade from your trees. We’ve listed the prices of trimming, removal and stump removal below, so you can know costs ahead of time. When you call a tree service professional to remove a tree, the price will range between $415 and $591. This is due to several factors about the service, including how many trees, the height, width, whether it’s an emergency situation, and if there has to be pruning done ahead of time to make the tree easier to take down without hitting your home or the power lines around your yard. The average cost will probably be around $503. Stump removal in Miami runs an average of $550, if you’re wanting the entire stump uprooted and taken away by the professional. It’s a more extensive job that can take around seven hours because of the roots, digging the entire stump up, moving it to a truck and whatever difficulties may present themselves ahead of time. In comparison, stump grinding is a much easier task that can be quoted to you by the hour. This runs a Miami resident between $76 to $140, since the stump will remain in your lawn but low enough to not be any real trouble. Pruning is an important part of keeping up trees in Miami and is even encouraged by the city. Doing so will help keep trees healthy and in check for when storms hit the city from the ocean. Maintaining your trees will cost between $280 to $372 with an average of $326 quoted to you by the professional landscaper or arborist who comes out to help you. In 2007, the Urban Forestry Working Group and Miami staff finalized a plan as a framework to restore and enhance the city’s tree canopy. The city of Miami supports more than just palm trees, and residents are encouraged by the city to help bring back the ecosystem. Removal, relocation, pruning or trimming more than 25 percent of trees require permits. Tree permits will also be required when trimming any portion of the roots. Tree removal and trimming should be completed long before hurricane season starts on June 1st, according to Miami officials. It’s recommended that having the trimming and removal done before hurricane season better prepares your house for lesser damages when hurricanes hit. According to Miami-Dade County, trees that will top out at 20 feet can be planted near overhead utility lines. Ones that reach 30 feet need to be at least 20 feet from all surrounding utility lines. Any taller than 30 feet should be at least 30 feet from all surrounding utility lines. The state tree of Florida is the sabal palm (Sabal palmetto). It is the most widely seen palm in Florida. It grows in almost any type of soil and can be used for food and medicine. The sabal palm is one of the most wind-resistant trees in any landscape, which mean it holds up against the hurricanes that hit Miami every year with ease. It reaches 40-50 feet in height with 10-15 foot palmate leaves at the top. In the summer a white flower appears followed by green-black fruit. Florida holds 130 reigning spots on the National Register for Champion Trees,with Miami home to many of them. So far, the tallest of them is the 115-foot korina tree at Flamingo Gardens in Davie. A lot of tropical fruits can grow in Miami because of its warm climate. Banana, cherry and mango trees are just a few of many different types that thrive in the climate. Pineapples, raspeberries and peaches are also good for growing in the area. Because of hurricane season hitting Miami so hard every year, there are certain types of trees that just don’t stand up well to the storm because they’re too brittle or have weak branches. These include trees like bischofia, avocado, African tulip, jacaranda, weeping fig, yellow tabebuia, Norfolk Island pine, and Queen palms. Also, seeds from plants in other parts of the world have blown into Miami and settled to grow. However, they have destroyed the natural order of the Miami ecosystem and are now banned by Miami-Dade County. 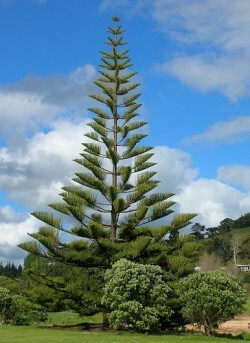 Some of these include the Australian pine (Casuarina spp. ), elephantgrass (Pennisetum purpureum), Gold Coast jasmine (Jasminum dichotomum) and more. For the full list, see the Miami-Dade County Prohibited Plant Species List. The County also recommends that any residents who see these species on their lawns have them removed immediately. Due to the invasive plants taking over Miami, there are various diseases and pests following them and attacking. Last year laurel wilt was discovered, which is a fungus that kills trees by cutting off their light and water supply and is transmitted by way of the female Asian redbay ambrosia beetle. 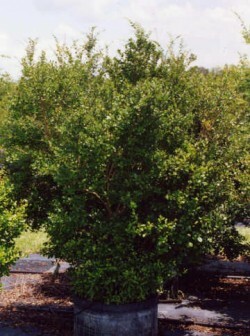 The gumbo limbo spiraling whitefly is another pest that can kill tree seedlings, early development, or unhealthy trees. The fig (ficus) whitefly has been attacking weeping figs and draining them of their juices, which causes their leaves to yellow and dry, eventually dying without treatment. Powdery mildew and anthracnose are also two common fungal infections that are seriously injuring the mango tree population of Miami. Anthracnose leads to fruit rot, while powdery mildew during the flowering stage of mango trees can reduce the amount that become fruit. The County is doing everything it can to make residents aware of what the signs of these two fungal infections are to prevent further death of mango trees in the area.